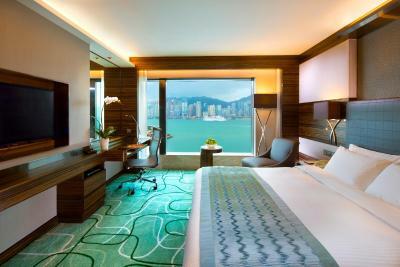 Lock in a great price for New World Millennium Hong Kong Hotel – rated 8.6 by recent guests! Loved the entire hotel, food, facilities, amazing view from the harbor side room and the bar on the top level. Everything. Buffet breakfast was great. Residence Club was well worth the extra money. Service there was impeccable. Allowed us to check in early, ~10 am, when it was scheduled for 2 pm. 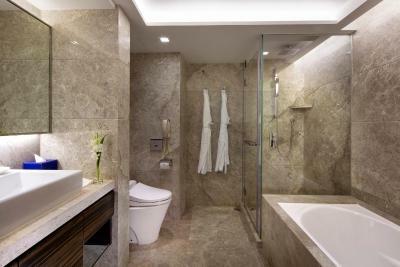 Great toiletries, comfortable bathrobe, free personal cell phone that you can use during your stay. 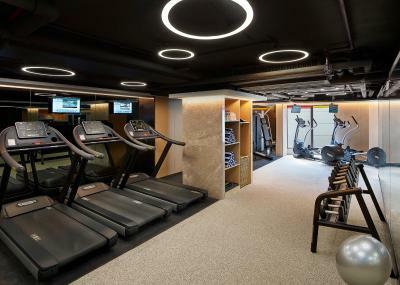 Fitness centre with sauna and steam room, beautiful change room. Room was spacious. TV with lots of channels, and in english as well. 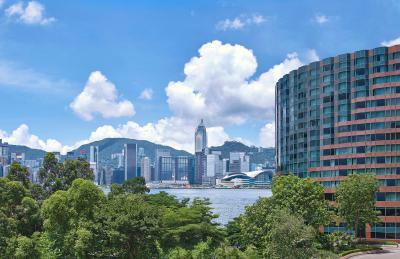 Good location, easy to transfer to HK Central. Free shuttle service. The staff at this hotel is wonderful. Everyone I spoke to was incredibly friendly and helpful. I had an issue with the door to my room and the management and engineers couldn't have been nicer. Additionally, the room itself was lovely. It was clean, comfortable, quiet, and much bigger than I expected. The harbor view was gorgeous! Home Away from Home! Lovely hotel. Room and bathroom were large. Housekeeping always brought up anything we wanted promptly and cheerfully. We had 2 rooms, one for our son and one for us. My son loved his huge bathroom with a separate shower, although he did not have a city view, as advertised. My husband and I had a lovely room, with a great view of the bay. Both rooms had superb beds, were sparkling clean, included great amenities, and the water pressure in the showers was terrific. The staff at the hotel was superb and the location was great for walking or catching the metro. Check out the upstairs bar which has beautiful views of the bay and is very relaxing. We ordered room service for dinner twice and the food was very good. The hospitality, friendly staff. 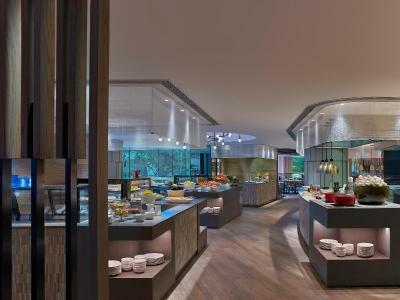 The lovely buffet, fresh seafood, bakery and awesome dessert. Comfy bed and clean room. Close proximity to Coliseum for those who are going for concerts. 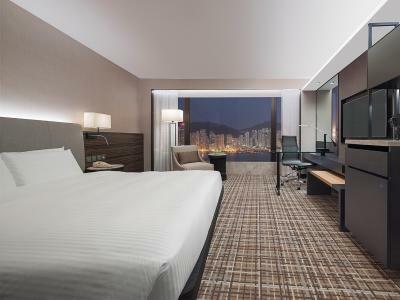 New World Millennium Hong Kong Hotel This rating is a reflection of how the property compares to the industry standard when it comes to price, facilities and services available. It's based on a self-evaluation by the property. Use this rating to help choose your stay! 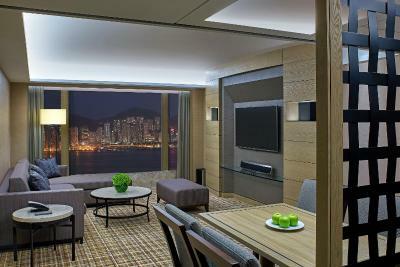 New World Millennium Hong Kong Hotel is located by the Victoria Harbor waterfront in the lively district of Tsim Sha Tsui East. 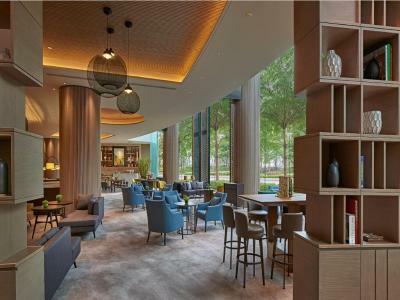 It offers 6 dining options and a health club with a rooftop swimming pool. 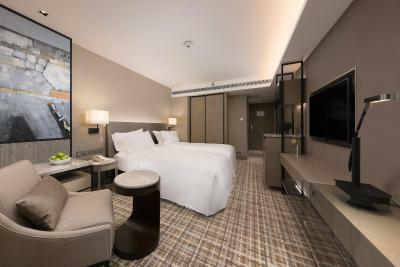 New World Millennium Hong Kong Hotel is less than a 5-minute walk from East Tsim Sha Tsui MTR Station and Hung Hom MTR Station. 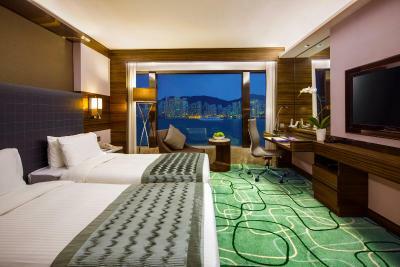 Hong Kong International Airport is around a 45-minute drive away. 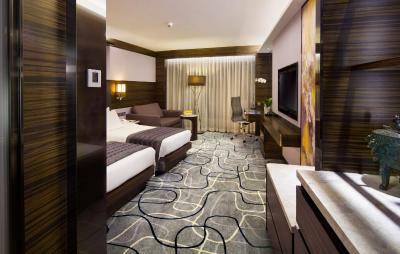 Featuring elegant interiors and decorations, each guest room is fitted with a flat-screen TV, well-stocked mini-bar and tea/coffee maker. 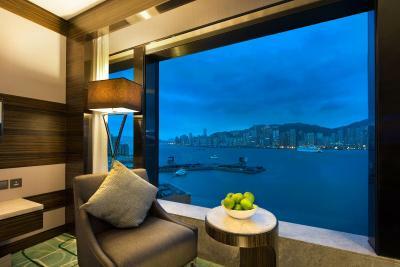 Most of the rooms offer views of Victoria Harbor. Free WiFi is enjoyable for in-house guests. The health club at the property features a fitness room and separate saunas for males and females. Guests enjoy free smartphone services with unlimited local and international calls to 20 selected countries, unlimited 3G mobile Internet access and WiFi hotspot. 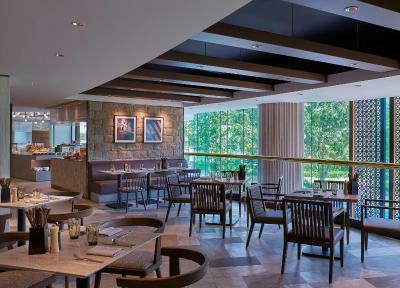 Guests can enjoy Kyoto-style favorites at Sagano and European food at La Table. 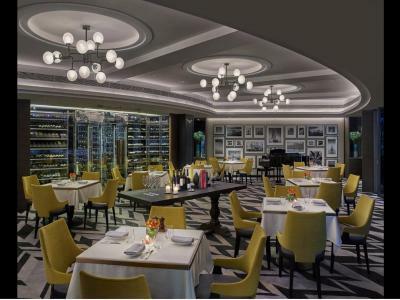 Café East offers an international buffet and Tao Li specializes in Cantonese dishes. City views and cocktails are available at Bar On 15. 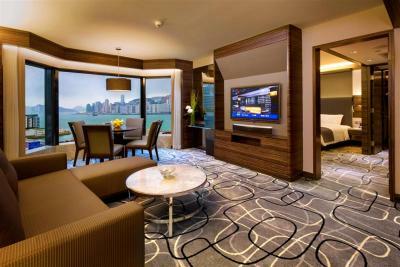 When would you like to stay at New World Millennium Hong Kong Hotel? 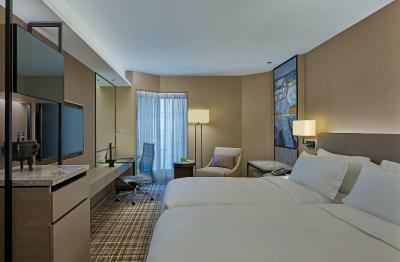 Featuring city views, this guest room has a bathroom with a bathtub, a walk-in rainshower and bath amenities. 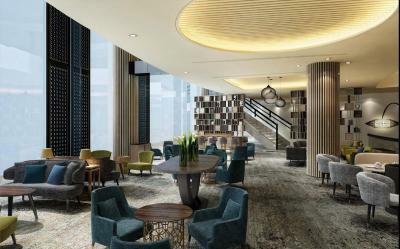 Other amenities include a 40 or 42-inch IPTV, working desk, mini-bar, free bottled water, individually controlled air conditioning, IDD telephone with a bilingual message box, alarm clock with USB charging port, hairdryer, electronic safe, as well as tea/coffee making faciliies. Guests can enjoy free WiFi and free use of a smartphone featuring unlimited local and IDD calls to 20 countries, unlimited 3G mobile Internet access and WiFi hotspot). 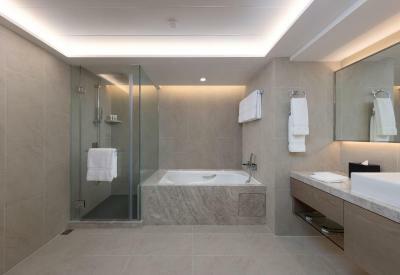 Featuring a marble bathroom with separate bathtub walk-in rainshower, electronic bidet and branded bath amenities, this guest room is equipped with modern facilities include a 40 or 42-inch IPTV, Blu-ray player, wireless Bluetooth speaker with USB charging port and a light-adjustable clock display. Other amenities include a working desk, free bottled water, individually controlled air conditioning, IDD telephone with a bilingual message box, hairdryer, electronic safe, as well as tea/coffee making facilities. Guests can enjoy free WiFi and free use of a smartphone featuring unlimited local and IDD calls to 20 countries, unlimited 3G mobile Internet access and WiFi hotspot). 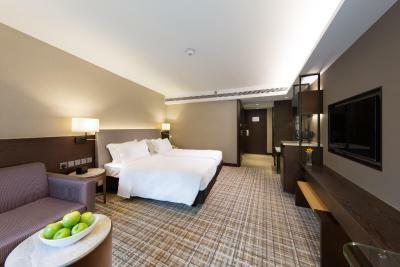 Overlooking a panoramic view of Victoria Harbor,, this guest room has a bathroom with a bathtub, a walk-in rainshower and bath amenities. 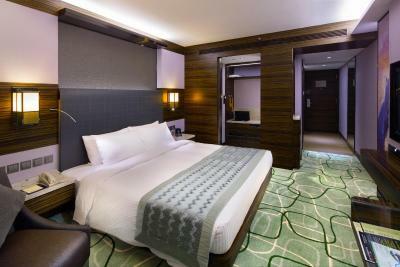 Other amenities include a 40 or 42-inch IPTV, working desk, mini-bar, free bottled water, individually controlled air conditioning, IDD telephone with a bilingual message box, alarm clock with USB charging port, hairdryer, electronic safe, as well as tea/coffee making facilities. Guests can enjoy free WiFi and free use of a smartphone featuring unlimited local and IDD calls to 20 countries, unlimited 3G mobile Internet access and WiFi hotspot). 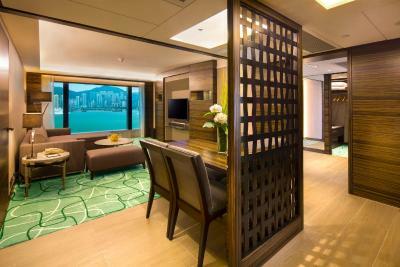 Boasting breathtaking views of Victoria Harbor and featuring a comfortable living room, a dining area and a bedroom, this suite features a spacious 66 sq.m. 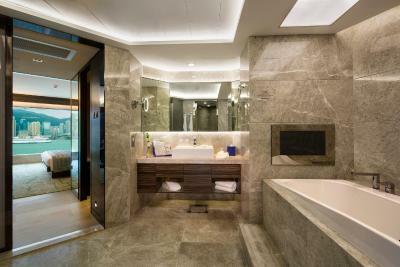 living space, a large marble bathroom with a separate bathtub, a walk-in rainshower, electronic bidet and branded bath amenities. 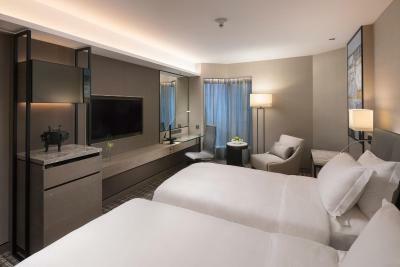 Other facilities include a 55-inch IPTV with screen mirroring function, home theater speaker, Blu-ray player, wireless Bluetooth speaker with USB charging port and dimmable clock display, as well as branded coffee machine. It also comes with a working desk, free bottled water, individually controlled air conditioning, IDD telephone with a bilingual message box, hairdryer and electronic safe. 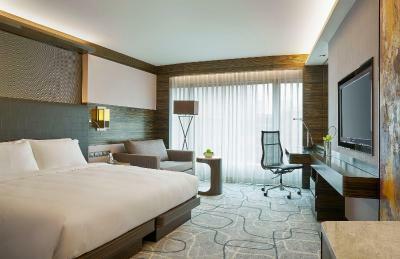 Guests can enjoy free WiFi and free use of a smartphone featuring unlimited local and IDD calls to 20 countries, unlimited 3G mobile Internet access and WiFi hotspot). 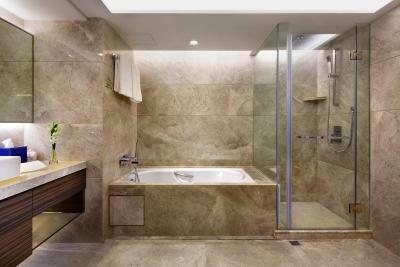 Overlooking glittering city views, this guest room features a marble bathroom with a separate bathtub, a walk-in rainshower, an electronic bidet and bath amenities. 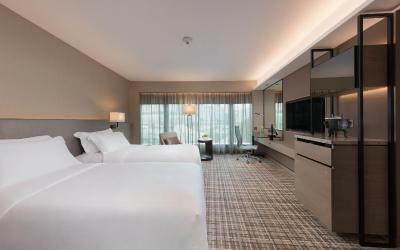 Other amenities include a 40 or 42-inch IPTV, Blu-ray player, working desk, mini-bar, free bottled water, individually controlled air conditioning, IDD telephone with a bilingual message box, alarm clock with USB charging port, hairdryer, electronic safe, as well as tea/coffee making facilities. Guests can enjoy free WiFi and free use of a smartphone featuring unlimited local and IDD calls to 20 countries, unlimited 3G mobile Internet access and WiFi hotspot. 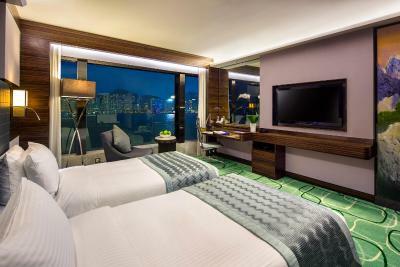 Overlooking a panoramic view of Victoria Harbor, this guest room features a marble bathroom with a separate bathtub, a walk-in rainshower, an electronic bidet and bath amenities. Other amenities include a 40 or 42-inch IPTV, Blu-ray player, working desk, mini-bar, free bottled water, individually controlled air conditioning, IDD telephone with a bilingual message box, alarm clock with USB charging port, hairdryer, electronic safe, as well as tea/coffee making facilities. Guests can enjoy free WiFi and free use of a smartphone featuring unlimited local and IDD calls to 20 countries, unlimited 3G mobile Internet access and WiFi hotspot. 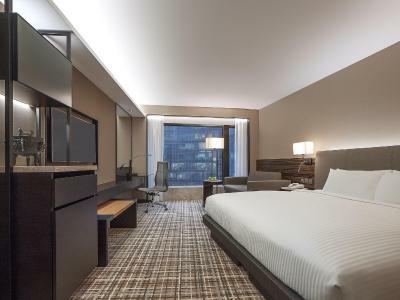 Featuring an private bathroom with a separate bathtub and bath amenities, this guest room is fitted with a 40 or 42-inch IPTV, working desk, mini-bar, individually controlled air conditioning, IDD telephone with a bilingual message box and alarm clock with USB charging port. For guests' comfort and convenience, a hairdryer, electronic safe, free bottled water, as well as tea/coffee making facilities are provided. Guests can enjoy free WiFi and free use of a smartphone featuring unlimited local and IDD calls to 20 countries, unlimited 3G mobile Internet access and WiFi hotspot. 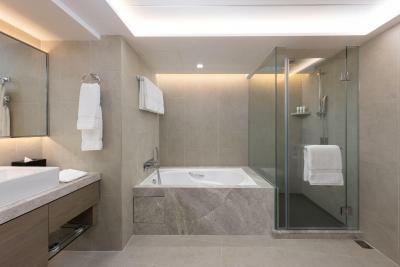 Overlooking glittering city views, this guest room features a marble bathroom with a separate bathtub, electronic bidet and branded bath amenities. Other facilities and amenities include a 40 or 42-inch IPTV, Blue-ray player, wireless Bluetooth speaker with USB charging port and a light-adjustable clock display. Other facilities include a working desk, free bottled water, individually controlled air conditioning, IDD telephone with a bilingual message box, hairdryer, electronic safe, as well as tea/coffee making facilities. Guests can enjoy free WiFi and free use of a smartphone featuring unlimited local and IDD calls to 20 countries, unlimited 3G mobile Internet access and WiFi hotspot). 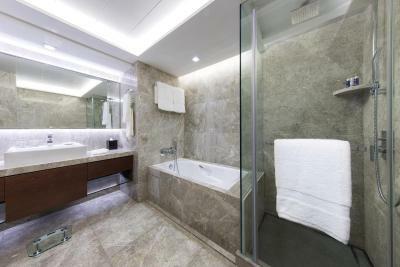 Overlooking panoramic views of Victoria Harbor, this guest room features a marble bathroom with a separate bathtub, electronic bidet and branded bath amenities. Other facilities and amenities include a 40 or 42-inch IPTV, Blue-ray player, wireless Bluetooth speaker with USB charging port and a light-adjustable clock display. Other facilities include a working desk, free bottled water, individually controlled air conditioning, IDD telephone with a bilingual message box, hairdryer, electronic safe, as well as tea/coffee making facilities. Guests can enjoy free WiFi and free use of a smartphone featuring unlimited local and IDD calls to 20 countries, unlimited 3G mobile Internet access and WiFi hotspot). 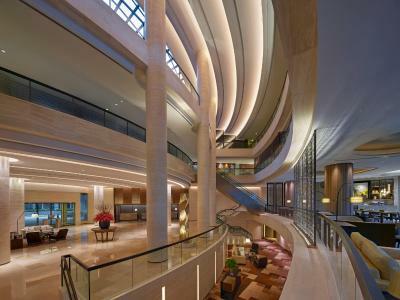 House Rules New World Millennium Hong Kong Hotel takes special requests – add in the next step! 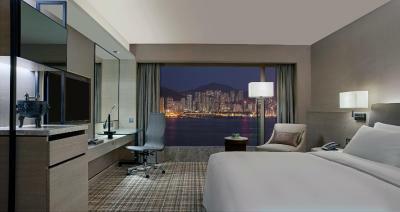 All children under 16 years are charged HKD 660 per night for extra beds. New World Millennium Hong Kong Hotel accepts these cards and reserves the right to temporarily hold an amount prior to arrival. For booking guaranteed by a 3rd party, booker needs to fill the authorization form at least 2 weeks prior to arrival. Third party payment is not available for later bookings. More information, please contact the property in advance. 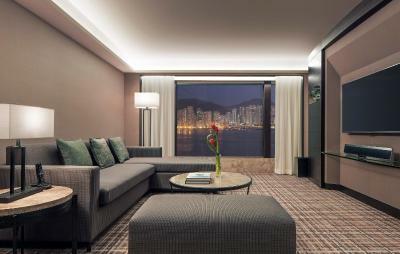 Please inform New World Millennium Hong Kong Hotel of your expected arrival time in advance. You can use the Special Requests box when booking, or contact the property directly using the contact details in your confirmation. Stayed in a 15th floor Executive room with access to the lounge for drinks and snacks each evening. The quality of the food was excellent and the staff there are exceptional. The breakfast was delicious with so many different choices. Everything was perfect but the mattress was pretty firm and I like firmer mattresses. Hamburger at the bar was about the most expensive I have ever eaten. Though I did manage to resist an $80 one at the Burg Hotel in Dubai once! Nothing that I could say. Did not have breakfast at the hotel. It was not included. Did not realize that it wasn't stated in the booking. It was a perfect stay. And Wish we‘ve had was fullfilled. Eggs were overcooked, had better breakfast off property. Only had one breakfast and it was terrible. The location. 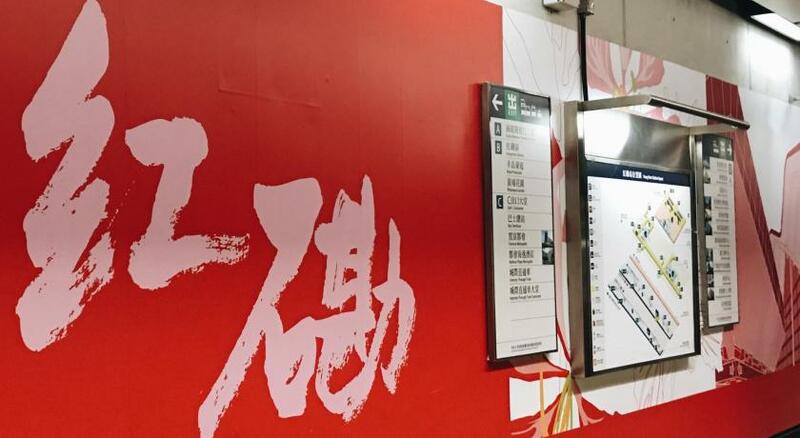 The nearest MTR is Exit P1 Tsim Sha Tsui which is 10 mins walk. Shuttle buses are provides however to certain location, every 30 mins frequency. Front door is always very crowded with tourist and buses.